Histological techniques 5. Lectins. Atlas of plant and animal histology. General staining and histochemistry may detect subsets of tissular molecules, but, except histoenzymology, they are not very specific. There are other techniques that specifically detect a molecule or molecular domain by taking advantage of the properties of molecules like lectins and immunoglobulins, which can recognize and link to a particular molecule or molecule domain. Lectins are proteins used to detect different types of carbohydrates and carbohydrate moieties. Although there is no chemical modification of tissular molecules, lectin technique are be usually found in histochemistry sections of textbooks. Lectins are proteins containing molecular domains that are able to recognize terminal carbohydrates present in olygosaccharide chains. The saccharides may be either free or as part of other molecules like glycoproteins. Thus, lectins recognize glycoconjugates, and they can be found in animals and plants with many fucntions. For example, the exit of lymphocytes from blood vessels are mediated by a type of lectin known as selectin. Endothelial cells near a damaged tissue express selectins in their surface that recognize and link carbohydrates of the lymphocyte surface. Once it is attached to the endothelial surface, the lymphocyte can cross the endothelial layer. In the histology lab, lectins are used to study the distribution of a variety of glycoconjugates. Each lectin specifically recognizes a particular carbohydrate. There are 5 types of lectins that recognize mannose (Man), galactose/N-acetylgalactosamine (Gal/GalNAc), N-acetylglucosamine (GalNAc), fucose (Fuc) or sialic acid (Neu5AC), respectively. There are many commercially available lectins that are named after the animal or plant they were isolated from. In the next table are shown the most used lectins and the carbohydrates recognized. Table 1. Common lectins used in histology labs. Carbohydrates they recognize and species they were obtained from are shown, as well as the acronym and the specific carbohydrate bond for each lectin. The symbol > means decreasing affinity to the right, meaning that a lectin can detect the same carbohydrate with a variety of chemical links, but with different affinity. The distribution of lectin-carbohydrate binding in the tissue may be studied by using different methods. In the direct detection methods, lectins are conjugated with enzymes, like peroxidase or alkaline phosphatase, or with fluorescent molecules (Figure 1). Once the lectin is attached to the tissue, the activity of conjugated enzyme can be observed by using specific substrates (histoenzymology), whereas fluorescent molecules can be observed with the fluorescent microscope. In the indirect detection methods, an interposed molecule is placed between the lectin and the enzyme or fluorescent molecule. Lectins are usually conjugated with biotin, and biotin is detected with avidin-enzyme or avidin-fluorescent complexes (Figure 2). 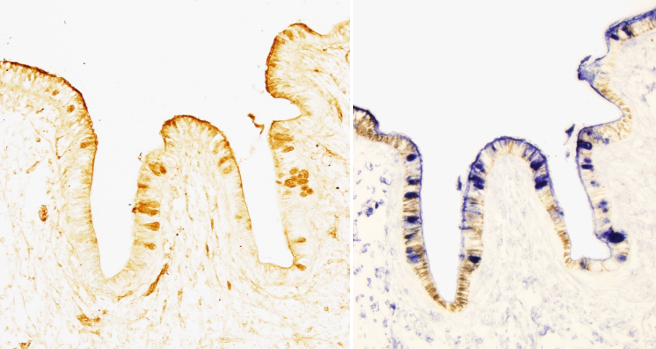 In tissue sections, lectins can also be detected by immunohistochemistry, that is specific antibodies obtained against the lectin. Figure 1. Carbohydrate detection with lectins by indirect methods. Sections of the epithelium of tuberculate abalone (Haliotis tuberculata). The image on the right shows glucosamine positive cells (brown color) detected with biotin-conjugated WGA lectin and posterior enzymatic development by using avidin-conjugate peroxidase. The image on the right isshowing cells (blue color) positive for fucose detected with digoxigenin-conjugated AAA lectin and developed with alkaline phosphatase. Figure 2. Carbohydrate detection with lectins. The incubation times may change depending on the lectin type and tissue. This is an indirect detection method because lectin is conjugated with biotin and the enzyme is part of ABC (avidin peroxidase complex). The colored labeling is the result of the activity of the enzyme that transforms the H2O2 substrate and DAB is then reduced and precipitates in insoluble colored substance form. BSA (bovine serum albumin) is used for blocking nonspecific binding sites. If the positive structures are intended to be observed at light microscopy, vibratome thick sections are used instead of paraffin sections. Lectin labeling is usually combined with other techniques that get more information about the carbohydrate composition of tissular glycoconjugates. For example, desulfation uncovers sulfate ester bonds of the terminal chains, and removing beta glycosidic bonds allows knowing if carbohydrate chains are O-linked (attached through a oxygen on a hydroxyl group) or N-linked (attached through a nitrogen) type glycans. Alkalinization removes O-linked bonds.